If Vigil needs a hand with its Warhammer 40k MMO, Relic will gladly offer it once it's finished making Space Marine. Vancouver-based studio Relic Entertainment has been the belle of the Warhammer 40k ball in recent years. It's made the solid Dawn of War RTS games, and its current project is the impressive-looking Space Marine, which isn't nearly as generic as the title might lead the uninitiated to believe. But despite having the most experience with the 40k license in the videogame biz, Relic isn't working on the Warhammer 40k MMO, Dark Millennium Online - that's the job of Darksiders developer Vigil Games. Relic and Vigil are both owned by THQ, however, and given Relic's experience working in the Warhammer 40k world, though, it only makes sense for one studio to lend the other a hand. That's according to Relic marketing manager James McDermott, who told Eurogamer that Relic would be willing to help Vigil if needed - once it was finished with Space Marine, of course. That's not to say that the two games will tie in with each other. "There's no crossover narrative," said McDermott. Still, he said, Vigil was "definitely interacting with us a lot because we have a pedigree and an understanding of the IP, which they're trying to develop." Vigil also took some pointers when it came to the game's combat, he said. "In terms of the some of the core mechanics, they were looking at our combat system quite carefully at one point to see if they could try and make it - not the same - but just have some level of consistency. That's definitely been a consideration." Once Space Marine ships this September, though, Relic might take a more active consulting role on Dark Millennium. "We just on the whole try to work as collaboratively as possible, and with Space Marine wrapping up, we may become more involved in just helping them on a day to day basis with some things as we move forward." I'm pretty sure there's probably some 40k quote about how "banding together in the eyes of the Emperor makes us stronger" or some such like that. 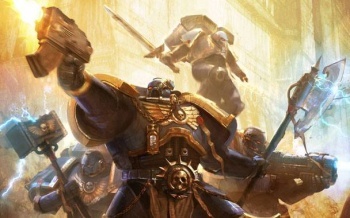 However, given that my knowledge of Warhammer 40k pretty much boils down to "one group of assholes fights ten other groups of assholes for control of a really crappy universe," I'm going to let you guys quote it for me in the comment thread. Thanks, guys!